Her highly anticipated marathon debut comes after Spence Gracey clocked a sub-1:10 half marathon, the 10th American to ever do so. On April 18, 26-year-old Neely Spence Gracey will step up to the line at the Boston Marathon as one of the top-ranked American female runners in the field—and she’s never run a marathon in her life. 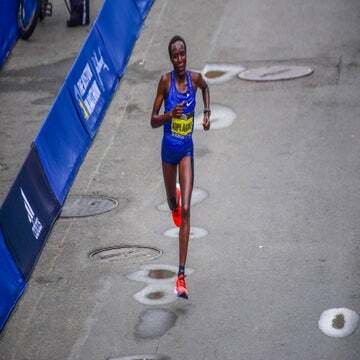 However, her performance at the 2015 Rock ‘n’ Roll Philadelphia Marathon last September, where she finished in 1 hour, 9 minutes, 59 seconds, put Spence Gracey on the map as one of the elite few who have broken the 1:10 barrier in the half marathon. We caught up with Spence Gracey just a week ahead of her big 26.2-mile debut, and it turns out her mindset and game plan isn’t that different from the thousands of age-groupers that will finish behind her. Women’s Running: Your half in Philly made you eligible for the Olympic Trials, but you skipped the February race due to injury and opted for Boston as your debut. How have you felt about that decision as of late? Neely Spence Gracey: At first it was really difficult. I was pretty devastated. It was a fluke, unexpected thing that happened—I had inflammation of the bone in my foot during the Rock ‘n’ Roll Philly race. I twisted it funky, and it didn’t respond well. I planned to take time off and just ended up taking two extra weeks to let everything fully recover. So it wasn’t until really December when I started getting into training, so I just felt it would be really rushed and really crunched to get in what I wanted to to compete at the Olympic Trials [in February 2016]. To me it didn’t make sense to do my first marathon not prepared, so as difficult as the decision was, I fully believe it was the best choice for me. I took my time—I gave myself 16 weeks of training instead of 8 [laughs], and that just made a big difference. Related: What The Heck Happened At The Olympic Trials Marathon? For me, when I was looking at what my options were, I could have rushed to do the Trials; I was invited to be part of the World Marathon Championship team; and I had Boston that they had proposed as an option. I had three things to consider, so when I felt I would be too rushed for the Trials, I needed something that got me just as excited as that, and Boston was that thing. WR: It must be an added thrill for you to be a top ranked American going into this race, right? NS: It is. It’s a very unique year in that it’s an Olympic year. Our top marathoners have made the team, so that’s their focus. So yeah, it is, it’s very nice, in a way, to be able to go in top American. Boston is also sponsored by adidas, who sponsors me, so it’s a win-win for my company that supports me. All in all it just fell into place really well, and I’m very pleased with the decision I made and how it all worked out. WR: Many people know the story of how you were born literally while your father, Steve Spence, was running the Boston Marathon. How does that special connection to the race influence this experience, if at all? NS: I would lie if I said it wasn’t influenced, for sure. I’ve always known I was going to run the Boston Marathon one day. I didn’t think it would be this soon, but at the same time, I am thrilled that it’s happening now. Everything just sort of fell together with perfect timing. I’m a little bit young to begin a marathon career [Neely will celebrate her 26th birthday two days before Boston], so I know I’m not going to get everything right the first time. I just hope I get enough right that I can have a successful and positive outcome. I can learn from it, so when 2020 rolls around and I’m 30, I’m well equipped to handle the marathon and hopefully make an Olympic team at that point. I see this sort of the beginning of my marathon career. It’s just one step closer to hopefully making that Olympic team in four more years. It’s all part of a process. But yes, Boston made me excited, and that’s what I needed. I’m thrilled to be part of it, thrilled it will be a debut, thrilled that it’s happening. WR: It’s also worth noting that you’ve never actually been to the Boston Marathon to spectate, but have you trained at all on the course? What are your thoughts? NS: I’ve never been there for race weekend, but from everything I hear, it’s quite the exciting atmosphere to be in. So I’m looking forward to that and counting on those crowds those last 6 miles to carry me farther than I’ve ever gone before. Back in January we went to Boston, and on a Saturday I ran the first 10 miles of the course, and on Sunday I did the last 16.2. So I covered the whole course. It was actually perfect—it was freezing cold, rainy, with a brutal headwind the entire way. So I’m pretty much convinced it can’t be worse than that. I’m going into the race thinking it will be like that, so I’ll be pleasantly surprised if it’s not! But I will say that the course is definitely rolling; everyone says it’s downhill until mile 18, and I’m thinking, No it’s not. It’s rolling, and there’s never really a break. It’s never really flat. I’ve been a good cross-country runner in the past, I’ve trained in the mountains quite a bit, and I’ve been incorporating a lot of ups and downs in my training. So I think I’m prepared as I’ll ever be. I think the rolling will help break up the monotony of 26 miles. You have to stay on your toes, you have to stay focused, you have to find the rhythm over just trying to hit a pace. That’s something that’s really important—it has to be effort-based, because if you’re on a mile that’s a little bit more of a downhill, obviously the effort is going to be easier than on the ups. So you have to be able to even out the effort, and that’s what I’ve been trying to practice. WR: What would be your best advice for others training for their first marathons? NS: Obviously I’ve never run a marathon before, but with my training and preparation, I try to break it up. I never think of it as one whole lump, because if I’m standing on the starting line and thinking, Okay, here I come, 26 miles, that’s going to be so overwhelming. But if I can break it up and think, My goal for the first mile is this, I’m going to get to the first water station at mile 3, then the 4-mile mark, it’s just one step at a time and not thinking of it as the whole race all in one. If I can break it up, I can have tiny little goals, I can gain confidence as I move forward, and I can stay focused of the here and now. The brain can only think of so many things at once. Staying positive and staying focused on the here and now is going to be essential for me, especially in those later miles where it’s unfamiliar territory. WR: That’s awesome! And when it’s all said and done, how will you celebrate? NS: My birthday is two days before Boston, so I will not be celebrating my birthday until after. So I’ve actually purchased ingredients to make my favorite cake—Hawaiian cake—and it’s pineapple with cream cheese icing. So I’m going to make a cake to celebrate, and I’m also looking forward to ice cream. I’ve refrained from ice cream for the last month leading into the race because that’s my big splurge for dessert. So that’s my focus the last month before a big race; I cut back on sweets, and I save it for after the race. WR: Sounds delicious! Looking ahead at the Olympic Trials on the track, will we see you in Eugene come July? NS: I don’t currently have a qualifier, so the issue with that is I’m not committing to any racing until I see how I recover after Boston. Track is up in the air, and all other summer races are up in the air until I give myself the two weeks off after the marathon and get back into things and see how my body responds. WR: Good plan. Last question—what’s the best advice your dad has ever given you that’s stuck with you through your running career up to this point? NS: My dad’s always been really good at helping me focus on what I can control. There are so many things that can go wrong during a race that are completely out of your control. I can’t worry about weather, I can’t worry about external factors. But what I can do is focus on what I can control. My prep has been great, I need to stay mentally within myself, so that way I’m focused on me and executing the best race possible for me to have the most success outcome as possible. I have been planning that, most likely, I’ll be running alone, and I’m okay with it. If I have people with me, that would be great, but I’m preparing to basically the most difficult situation, so if anything is easier or better, I’m pleasantly surprised.